######Install a package and also update package.json with the installed version and package name. ######Install a package and also update package.json with the installed version and package name, but into the devDependencies section. ######Set --save as a default for npm install . ######Generate package.json in a module directory, based on npm parmaters. ######List all npm configuration flags. ######Update the global npm version. ######Display the readme.md / documentation / npmjs.orf page of a give library. ######Uninstall package (A nice thing about npm is you can always just rm -rf ./node_modules/<module_name>). npm config set editor "sublime"
How do you install a package from a tag? Is it just npm install packageName --tag beta? @chevex Not sure if you mean npm tag or github tag. npm config set init-author-name "Your name"
npm config set init-author-email "your@email.com"
By default npm uses .gitignore to ignore files to include in the published package. If you need a different set of ignores, use .npmignore as well. 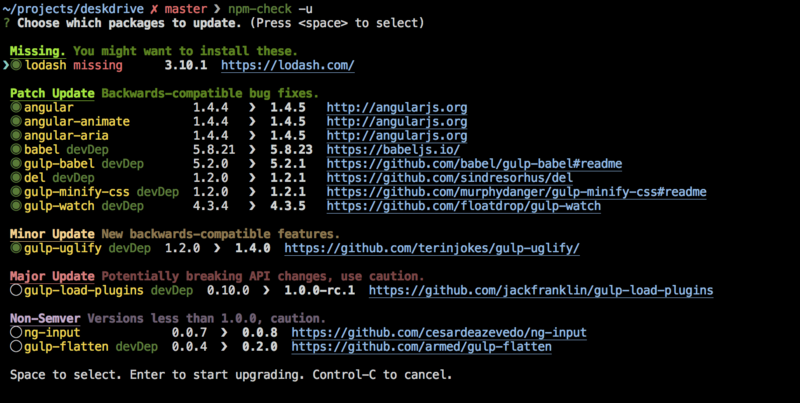 Not part of the npm cli, but I find npm-check a lot easier than npm outdated. Instead of only listing the outdated depenencies, it can print out commands to copy-paste to update each outdated dependency, or use the interactive mode where you just mark the dependencies to update.